However, to use the untypical font requires extra effort. You need to download and install them separately for each computer where you work with PowerPoint or embed in PPTX files (which can be tricky, read postscript). Anyway, the visual result can be worth the effort. 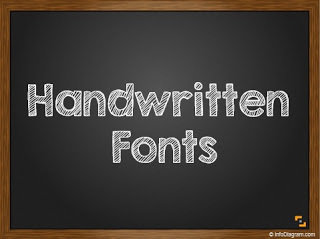 See an example of using those fonts in our Blackboard PowerPoint template. Segoe Print – practical font, no need for additional installing. If you want problem free nice script font to choose the one from default fonts present in MS Office (2007, 2010, 2013). Nice looking font resembling handwritten style is Segoe Print. KG Second Chances Sketch – great on a black background. We recommend this nice & readable font, especially for dark backgrounds. Just avoid using bold, it will lose its nice inside sketching. To use it in PowerPoint or Word, you need to download it from a font stock website and install it separately. Free for non-commercial use or buy for commercial use. Architects Daughter. Interesting name for the interesting font. I wonder what’s the story behind this font name :).This is also not standard MS Office font, you have to install it separately. Free for commercial use, see license and download. Permanent Marker – thick and well readable. This font we like a lot. It looks great, it’s very readable also from a distance because of its thickness and has an elegant handwritten look. Again, this is not a standard MS Office font. You need to install it separately (and buy it, too, if it’s for commercial use). P.S. A few remarks on embedding fonts. Theoretically, you can embed non-default MS Office fonts in PPTX file, but there are a few issues you should be aware of. The PPTX file gets bigger (1-5 megabytes more). Editing PowerPoint file with embedded font can be slow, as we experienced it on some older computers. And you should check if you are not breaking the font license rules when passing font like this. Usually, the users should download the font themselves, to ensure they read and agree with the associated license terms. Enjoy your fonts exploration. Share in comments which of those fonts you like the most? Do you recommend some other font for unique slide design? New suggestion of nice fonts I use now: Amatic (nice narrow) and Lobster Two (wide one). Both available free from fontsquirrel , as far as I know. Try them out.